Marijuana pest control is something gardeners have had to deal for centuries. Whether they are birds, insects, mammals, or even other humans, cultivated plants seem to have a target on their backs. While humans don’t really eat raw cannabis, some pests certainly seem to like the taste. If left unchecked, an infestation can end up ruining your crop. At the same time, using harsh chemical products to repel the pests can be harmful to you later on. To avoid all that, we have compiled a list of some safe and effective repellents (and other safety precautions) to keep bugs away from your cannabis plants. Do you think you have bugs or pests on your marijuana plants? Please read this article to identify all pests on marijuana plants and learn how to treat them. The problem with unsterilized soil is that it can contain the eggs or even larvae of some common marijuana pests. If you grow your marijuana in that soil, you will be in for a rude surprise when those eggs hatch or those larvae start to grow up. This is particularly bad for indoor growers because there are no natural predators inside your house. For large amounts of soil use 2,5 tbl sp of 3% peroxide per gallon of soil. Don’t forget to use fertilizers when you’ve sterilized your soil. Interspersing the marijuana garden with a few naturally repellent plants is certainly a good way to keep the predators away. Although the THC that marijuana produces acts as a natural repellent in its own right, it is often not strong enough to repel all plants (especially in the early stages of life). Particularly pungent plants like geraniums and marigolds will keep many leaf-eating insects and worms at bay. You can even plant some onions to ward off bigger pests like deer or rabbits. This garden favorite has a strong scent that is perfect for keeping away thrips, beetles, aphids and flies. Some growers even claim that it can increase oil production and flavor. Regardless of whether that claim is true, having some extra basil around is not a bad idea. Worried about a nitrogen deficiency? Planting beans may be your remedy. When beans are growing, they absorb nitrogen from the air and deposit it as nitrites into the soil. Marijuana plants thrive on these nitrites. With beans around, they grow stronger and are actively protected from a slow death due to nitrogen deficiency. Garlic is a popular companion because it protects against pests and molds. It is a natural fungicide that protects marijuana plants from deadly disease. If not planted next to your plants, it can also be used in spray form as a spot treatment. Marigolds are what many growers call a ‘beautiful distraction.’ When marijuana and marigolds are planted together, cannabis-loving animals opt for the marigold. It’s so strong that you could create a virtual fence of protection by planting marigolds around your plants. Mint is a wonderful companion plant because of its odor. Many garden pests hate the smell of mint and avoid going near it. It also masks the smell of freshly blooming marijuana, keeping your grow area a bit more private. Use mint with caution, however. Once planted, it tends to have a mind of its own and may overrun your garden; so, plant mint in a pot instead of in the ground. Chili peppers are a wonderful way to keep away large pests such as deer, mice, and rabbits. The chili pepper plant also has a root system that gives off a chemical that protects your cannabis plants from rot. These plants are especially useful in areas with poor drainage or excess rainfall. Of course, if you’re growing marijuana outdoors, you can make use of a few pest predators. 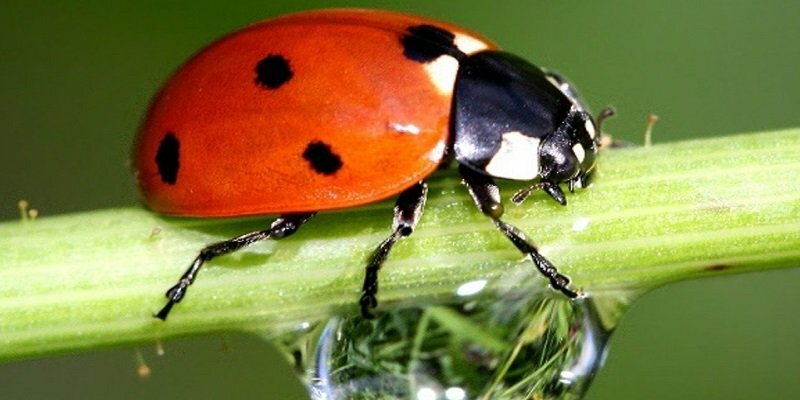 Ladybugs are notoriously beneficial to have around your outdoor marijuana plants because they love to prey on larvae and other potential pests. You can buy life ladybugs at this website for around $5 per 1000. You should also encourage birds to nest in the area because they often like to snack on some pernicious marijuana pests. Put out some bird houses or a bird feeder to get birds to come around. Just make sure that they stay away while the seeds are germinating because many birds do enjoy the taste of a marijuana seed. That’s because they won’t want to enter territory that a much larger predator has been roaming around in. The same is true for rabbits and fox urine. You can buy these scents at many sporting goods or outdoor shops. If bigger animals are a problem and the scent of their enemies doesn’t deter them, then you might need to try building a fence around your plants. Obviously, many marijuana growers don’t have this luxury and it’s really only something that people growing on private land can do. Here’s a link with tips on how to build your fence to protect your marijuana. With a permethrin-based repellent, you can keep insects away from your plants without using the synthetic spray on the plants themselves. Simply spray a ring on the ground about 6 feet away from the plant. Any bugs that come into contact with the permethrin will die or just evacuate the area. Oil Spray is a mixture of vegetable oil and soap, while soap spray is a soap and water solution. Both are basic insecticides, killing insects such as aphids, mites, beetles, and thrips. Other natural ingredients, such as neem oil, garlic, and chili powder can be added to the oil or soap sprays to increase effectiveness. For best results, spray plants at dusk or dawn. Oil spray insecticide can easily be made from mild soap (Castile works great) and vegetable oil. This simple, yet effective spray will kill insects such as aphids, thrips, and mites by suffocation. The solution blocks their pores. To create your own solution, mix 1 cup of oil with 1 Tbl of soap. Mix it up well then dilute 2 teaspoons of it in 1 quart of water. Soap spray insecticide is similar to oil spray, except it doesn’t have the vegetable oil. It also kills insects but is particularly useful for whiteflies, mites, and beetles. Soap spray and oil spray can be used at any time, but are best applied near dawn or dusk. To make a soap-based insecticide mix 1 ½ tsp of mild soap with a quart of water. Spray it directly on our plants. The Neem Tree has a natural defense system in the form of oil that makes it difficult for insects to survive. It is a hormone disrupter that keeps insect predators away. Neem Tree oil is safe for everything except insects and is also a power fungicide. Use Neem oil insecticide to drive away and prevent insects, as well as fight powdery mildew and other fungal infections. Neem oil insecticide is available at most garden stores. You can also create your own mixture by combining 1 tsp of liquid soap with 2 tsp of neem oil in 1 quart of water. Although garlic may actually be an insect repellant rather than an insecticide, it is still quite effective. Garlic is ideal for at least slowing down an insect infestation. Spray as needed on infested plants. To make a garlic spray insecticide puree two bulbs (not cloves) of garlic in a blender with a little water. Leave it overnight, strain, and add ½ cup of vegetable oil, 1 tsp of mild soap and enough water to fill a quart. Mix 1 cup of this mixture with another quart of water. Spray as needed. Like garlic, chili pepper may be more insect repellent than anything else. Use it in your garden, but remember to wear gloves and protect your eyes, nose, and mouth. The spray won’t harm you, but it might hurt. Create homemade chili spray out of fresh chili peppers, or use chili powder. If using powder, mix 1 Tbl of the powder with a few drops of liquid soap and 1 quart of water. From fresh peppers, puree ½ cup of peppers in a cup of water, add a quart of water and bring to a boil. Let the mixture cool, strain out the peppers and add a few drops of soap to the liquid. Your homemade spray is safe to spray directly on your plants. Fossilized algae buried deep in our earth is a natural resource that also makes a wonderful insecticide. Unlike other materials, diatomaceous earth does not poison or suffocate insects. It does something entirely different – it dehydrates them. Diatomaceous earth is easy to find in most garden stores, but it’s generally sold in bulk. You won’t need much to get the job done. To use it, simply dust the area around your plants and on the plants as well. It will keep away insects, as well as snails and slugs. Don’t forget to reapply after it rains. Sometimes, a mixture of a few natural remedies makes the best spray. To create an all-in-one insecticide, puree 1 garlic bulb, a small onion and a teaspoon of cayenne pepper powder. Let the mixture sit – ideally for an hour. Strain the material and add 1 Tbl of liquid soap. Do not dilute. Spray on upper and undersides of leaves. Store in the refrigerator for up to a week. Although hardly tried-and-true, tomato leaves may actually be a natural insecticide. As a member of the nightshade family, they contain alkaloids that keep aphids (and other insects) at bay. To make tomato leaf insecticide, steep 2 fresh tomato leaves in a quart of water overnight. Strain the material and spray the liquid directly on your plants’ leaves. Many growers have opted for pungent, organic repellents to keep pests away from both their indoor and outdoor plants. Concoctions like cinnamon oil, clove oil, and coriander oil have all had relative success without causing any damage to the plant. You can easily spray these repellents directly onto the cannabis leaves with no fear of any adverse reaction. Of course, different cannabis strains might have different reactions to any homemade organic repellents, and you should always test the repellents on an inconspicuous section of the plant to make sure no harm is done. Although it might not seem like it, it is actually more difficult to control pests indoors than it is outdoors. There’s really a small window of vulnerability between germination and seedling state when you have the plants outdoors. When they’re indoors, however, the pests can ravage your entire garden up until late in the vegetative state. Once you have bugs in the house, it’s hard to get them away from your marijuana plants. It’s always best to try using preventative measures so that bugs never become a problem in your indoor garden. Here’s a list with all pests on marijuana plants and how to treat them. Download my free grow guide and order some high quality seeds at this link here. We ship seeds to the US, CA and many other countries. For any growing related questions please visit the marijuana support page. I signed up to get a free book, Marijuana Grow Bible, but all I receive are many, many emails. Please send the book. Jorge, If you are the guy; I have read your book. The Free Grow Bible is an ebook. Comes in pdf form. Thanks for your interest. please send marijuana plant care book. Love the grow bible. Nice !! Excellent for your post. Thanks sharing for us. Im a outdoor grower and ive always found Neem oil in water with tiny drop of dish soap to be a winner for all. Neem works by addleing the bad bugs and keeping the good one's Ie ladybirds. Using beneficial nematodes is also a natural and safe way to combat pests. Check out Steinernema feltiae.